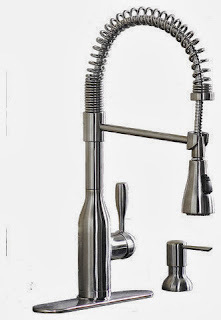 Does anyone sell a true stainless steel kitchen faucet? Home » Stainless steel kitchenware » Does anyone sell a true stainless steel kitchen faucet? Looking for a three hole faucet with single control lever, high loop faucet, and separate sprayer. Must have a deck plate. Most of the faucets I have seen advertised as "stainless steel" refer to the finish, not the actual material. Problem for us is brass faucets corrode after about 5 years, so we are looking for something that won't. Stainless steel is the answer for us but can't find solid stainless steel. Our well water has a low Ph value, about 5.9 as tested. We built with all PVC pipes as a result. The water passed state standards in all other aspects. We have been drinking it for over 30 years. We do run a water softener and Ph neutralizer in the winter, but in summer we don't have enough water to backflush on a weekly basis so have to shut it down for 2-3 months. Hmm, sounds like a problem with your water supply. Are you on a well? But I'd look for Corrosion-resistant faucets. Supposedly a company called Kraus has one that's entirely Stainless steel construction, but I don't know if that's what you want.